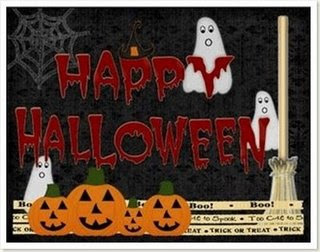 Happy Halloween!! Hope everyone is enjoying their trick or treaters this evening. We get 2 trick or treaters, my sister and her friend that's it. My sister loves pirates so I made her a pirate halloween card. The little pirate on the scallop circle and the Arrrrr are rubons that I bought last year at a after halloween clearance sale. The middle strip is a SU wheel that I colored in. My sister was thrilled with the card. My sister's friend's brother is going through a rough time right now, actually that whole family is. I made this card for the family to let them know I'm thinking of them and to let the brother know to hang in there better days are ahead. 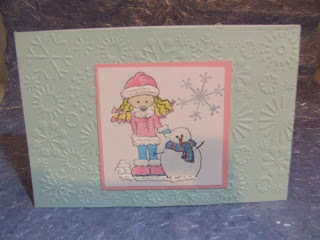 The the base of the card and mat is SU Chocolate Chip and all the other paper is from CTMH. The image of the monkey I received as blog candy awhile back and the the saying was done on my printer. The saying in the picture looks crooked but on the card in real life it's not, I swear. I keep looking at the card and even had Jeff check it. My sweet friend forgetfulone who always knows how to cheer me up Boo'ed me. Isn't this so cute. I could really use all the cheering up I could get things have been so stressful. 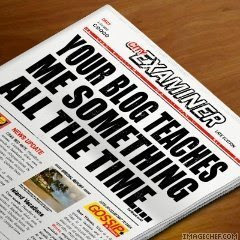 Now, this is how Blogging Boo will work. Go to as many friends as you want and tell them they've been "Booed". 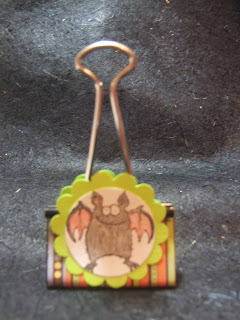 Have them link back to your blog to pick up their Halloween Treat (picture)! Tell them to "Boo" their friends. Then, put the picture in your side bar so everyone knows that you've already been "Booed". So, are you scared yet!!?? Well, you better be!!! BOO!!! One more time - the rules - short and sweet! I'm off to boo a few friends! 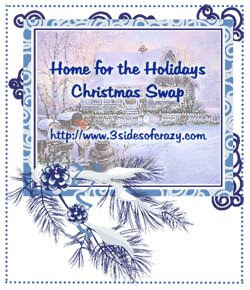 Click on the link above or click here for the details on a fun holiday swap being hosted by 3 Sides of Crazy. I am so looking forward to taking part in this swap. This weeks Sunday Scrappin challenge is to use up some of your ribbon stash. Make a border, make a bow... it's up to you, but let's see some ribbon on this week's projects! This will be an easy one I have loads of ribbon. 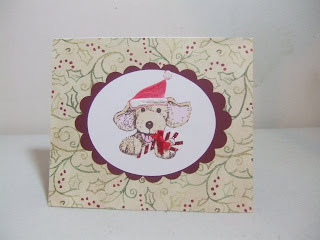 This weeks challenge at Crafty Creations (formerly known as SBS18 Challenges) is a Dog/Puppy theme. Anyone who knows me or reads my blog knows I have a yellow lab dog named Buddy that I'm head over heals for (you can see pictures of him on my picture blog here). When I saw this challenge I knew I had to play along. Santa Paws - I had this stamp in my stash for awhile and when I open the dog/cat stamp draw the light bulb lite up with this card idea. The paper is also from my stash if I recall correctly I think I got it from a swap awhile back. The Santa hat is from SU Cold Play stamp set I stamped it then cut it then adhered it to the dog. The white fur parts of the hat are done with snow writer (love that stuff). The little candy cane is a Jolee sticker from my stash also. Thinking of you - This card was tricky I wanted to use browns I always want to use browns when it comes to dog scrapbook pages or cards. I guess the browns go better because of my dogs color (yellow) but I wanted to stay away from that. These 2 colors of cardstock where laying out on the desk for some reason and the light bulb went off again (wow 2 times in one day, I'm impressed). The yellow was ran through the cuttlebug using the swiss dots embossing folder. On both cards the scallops and circle/ovals were made on the cricut using the storybook cartridge. You ever have one of those images that just scream use certain colors on me and you can't get past that and every card is in those colors? That's what happened here. This little cutie screams pink and blue to me. The image is from SCS WishRak group. The first card is actual for the Saturday Sketch challenge. #21 The white parts on the girls jacket and snowballs and ground where done using snow writer . 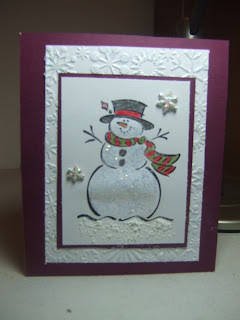 The snowman was done using Glistening Snow Writer (which is more creamy dimensional glue) http://www.decoart.com/cgi-bin/Products.cgi?Snow_Writer The snowflakes are embossed with the cuttlebug snowflakes embossing folder. (you can click any of the photos to make them bigger to see the detail). It's Sunday once again which means it's Sunday Scrappin time! 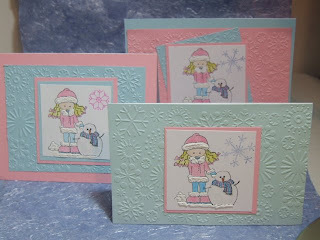 Be sure to go over to Sunday Scrappin and see all the other creative crafters posts, they are truly a creative group. 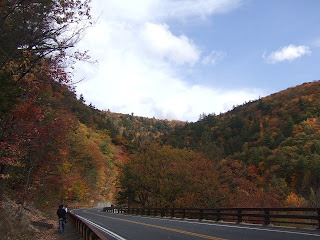 Be sure to check out my other blog at http://theworldthroughchrissyslens.blogspot.com/ for some fall foliage photos and just of photo's around my town. I don't have a card to share but I have some photos from today. We drove around the mtn side today taking pictures. 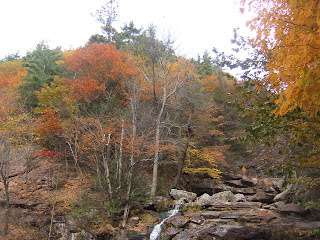 We went to the Katterskill Falls in Palenville NY it is the highest waterfall in New York state at aprox 260 feet high. 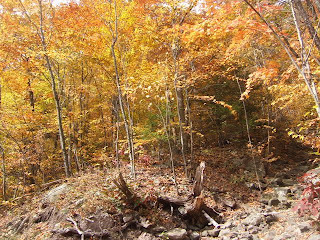 We took the trial up along side the fall which it was gorgeous, chili but so pretty. We got to the top (not the tippy top) and I felt very dizzy and light headed. I never had an issue with heights I've been on some the highest and craziest carnival rides, I have flown no problem don't know what it was today. Maybe it was the elevation, I don't know. 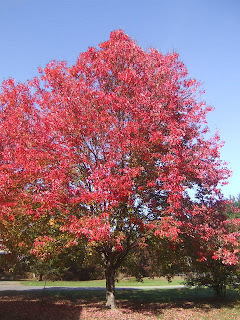 The first photo of the red tree, that is my baby that tree is in our front yard, I love it. It is so bright and vibrant, it's gorgeous. I'll be back later or tomorrow with a card to share. Have a great weekend! 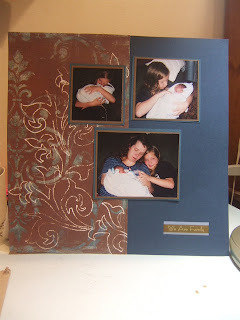 I came across a new blog challenge group called DRS Designs. Challenges are posted every other Monday this particular challenge was to use a sentiment as the focal point of your creation. 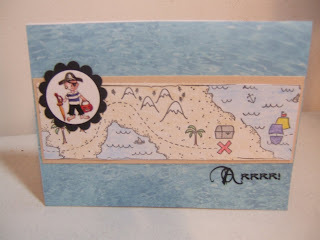 I received this sentiment image free when I placed an order at Rubbernecker stamps (they have treasure hunt Tuesday you place your order on Tuesday and they give you a clue what stamp is free and you have to go through there store find and it put it in your cart and you get it for free). 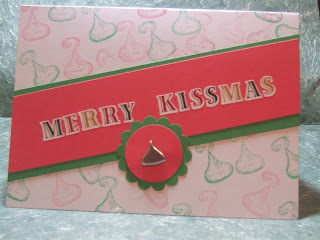 I just came across this blog tonight http://myscrappinplace.blogspot.com/ and she is doing Bingo and the person who wins the bingo gets a cool blog candy package of fun scrapbooking items. Doing Bingo like this is such a great idea and has it gets closer to my Bloganniversary/birthday (December/January) I am adopt this idea to. I love the idea. 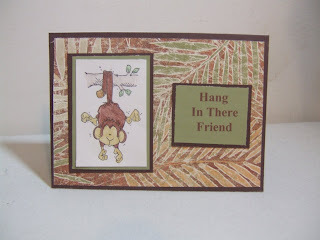 So be sure to check out her blog http://myscrappinplace.blogspot.com/ and get in on the bingo fun. This card is actual a coloring sheet that I printed out (coloring page can be found here). I printed it out and shrunk it down some and traced it onto a piece of folded cardstock it folds at the hand and wing of the bat on the left. Then I printed it out onto the various colors of cardstock and kept cutting and layering. 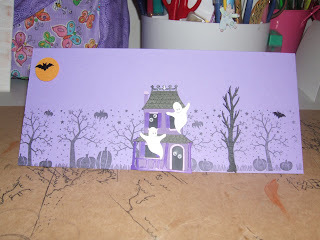 The bats are pop dotted to give them some dimension. The one card is for a swap partner and the other is for our niece Summer. I am part of a secret Boo Friend swap. It works the same way as a Secret Santa Swap but this one is a Halloween theme. We had to make several handmade items and also buy some items. 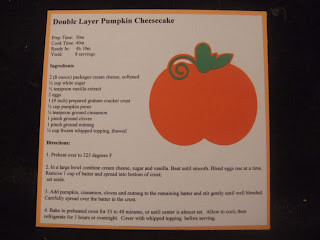 One of the items we had to make is a Fall recipe card. Those who know me know I don't know the first thing about cooking or baking. But thankfully there is the Internet and I was able to pull this recipe from here. The pumpkin is from the Cricut Dreams Come True cartridge. And no don't expect to see anymore recipe pages, not my thing, put I'm pleased with the way it turned out. It's been another hectic, crazy, stressful week but it did end on a happy note. We have finally after millions of attempts found a lawyer that will handle our case against our neighbor and we have a very solid case (it's not that no lawyer wouldn't take it before it's just they either know him personally or they represented him - how many lawyers does one man need is beyond me). Continuing on that happy path this week my sister will be joining us at Sunday Scrappin so watch for her post later. I'm so happy that she is really getting into this craft. 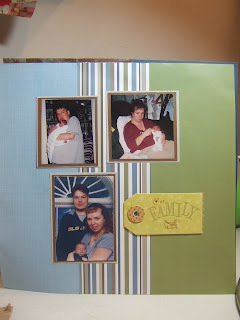 These two photo's are what I created this past week for our Sunday Scrappin Challenge to make something mainly orange. 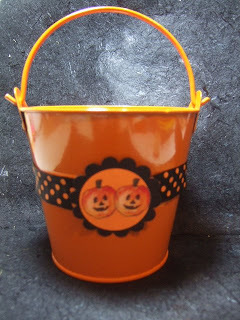 I love these buckets, they are a $1.00 in the Halloween section at walmart and are so easy to alter. I picked up a few that I hope to get around to decorating to send to our nieces, nephew and my sister. This weeks Sunday Scrappin Challenge is to use something clear. It could be acetate used for a shaker card, an altered container that's clear, a piece of clear-ish vellum.... use your imagination! Here are a few tutorials if you need ideas. Hmmm.... I made an Acrylic Post-It Note Holder Last year that was fun and simple (can be seen here or maybe I'll make another Calender Here) probably a good idea to start thinking about those handmade Christmas gifts. The leaves are finally starting to change colors. I love this time of year. We have a tree in our front yard that turns a vibrant red, I can't wait for the leafs to fully change on it. 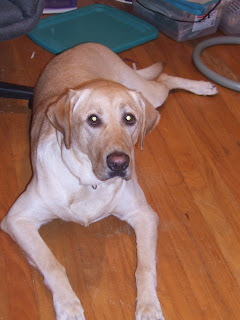 Our dog Buddy is the perfect fall color (yellow lab) so I can't wait for the leafs to fall for him to go out and play. This time of year there are so many gorgeous photo opportunities. The card I made today is for 3 challenges. The first challenge is for Saturday Sketch Challenge (Love this sketch I have a birthday card idea using this sketch to - hope to work on that tomorrow), second is for the SBS18 Challenge to make a card with an Autumn Theme (I haven't played along with these girls in awhile), and lastly for the Sunday Scrappin Challenge to make something mainly orange. 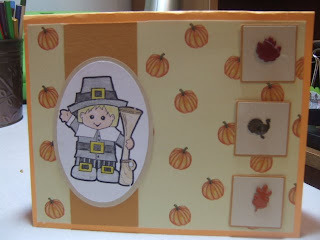 The pilgrim is a stamp I bought from Rubber Necker Stamps and the leafs in the squares are brads and the turkey in the square is a brad. I usually only scrapbook our son Dylan's pictures once a year and that is either around his birthday, kind of my little tribute to him. We have one photo album filled with pictures but it's just not an easy subject to scrap and I am never happy with the way the pages turn out. 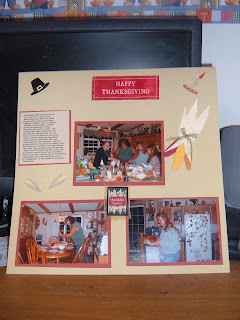 I bet I could have a professional scrapbooker create Dylan's album and I probably still wouldn't like it. Don't get me wrong, there is no right or wrong way to scrap. These pages are no exception they are done and they are "OK" but they are not "Great". The page on the right is of my Sister and I with Dylan (she sure was a proud Aunt look at that big smile on sister's face, one day I pray she'll be an Aunt because I know she will be an awesome one). Dylan would have been 4 years old on the 26th of this month, so hard to believe. We are blessed that we were able to spend 3 fabulous months with Dylan, but always wish it was longer. You can see more of the Dylan pages I have made here and you can see some of my favorite non scrapbook pictures of Dylan here. My blood is still boiling from the situation yesterday (read about it here). The neighbor who is a grown man keeps acting very immature and doing things that are just wrong! My frustration is my dog isn't a bad dog like I said he seldom seldom gets lose he's a dog it's going to happen. BUT that's NOT what this post is about. I created a card this evening to try to keep my sanity, the little that is left. 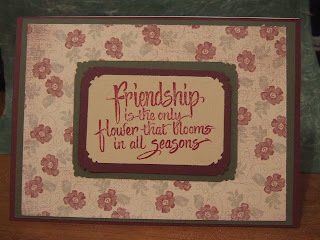 I love my glitter and this card shows that. The snowflakes are cuttlebugged with the snowflakes embossing folder then I sprinkled SU Dazzling Diamond Glitter all over it (sorry hard to tell in the picture - sorry for the poor quality of a picture it's dark out but I'm impatient and want to share now). 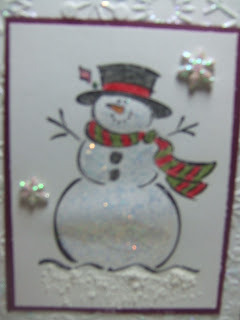 The Snowman is done is Stickles Icicle glitter. 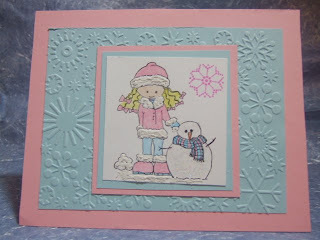 The Base under the snowman is done using Deco Art Snow-Tex (I forgot I have snow writer and that stuff is a lot better - next card). The snowflakes around the snowman are charms that I broke off the loop (they were already glittered). I think this will be one of my Christmas card designs this year, I have one other idea. I do apologize normally I would not post anything but craft related items on this post but I am calling for everyone's help. My dog Buddy occasionally slips his collar/leash and when I say occasionally I mean once a month if that, we always walk him on the leash. Sometimes we go out of the house and the door doesn't catch and he comes out etc. . When he does he runs over to the neighbors yard and either my husband or I are quick behind Buddy to get him back. The neighbor today made the comment "If your dog comes over here one more time I will shoot him" and it was said in anger. I am lived beyond belief. We called our local police department there is nothing they can do being Buddy "isn't human". They can only do something if the neighbor was to shoot Buddy. Can you imagine??!??!?! I called the ASPCA and I am waiting to hear back for an investigator. This is just the tip of the ice berg with the issues we have with our neighbor. His dog is continuously coming in our yard several times a day if not more. Does anyone have any other solutions for what I can do? We have invested in an above ground electric fence that we have installed and will begin using. But still how does someone get away with threating a dog? Buddy is not a vicious dog at all. I have learned so much from different bloggers, websites but the one that sticks out in my mind right now is Mel Stampz. She is so creative and she can take the simplest item and turn it into amazing piece of art. Every blog I read inspires me and teaches me something new whether it be a layout idea, color combos that wouldn't have thought of putting together, different techniques etc. you all teach me something and I'm thankful for each of you. I picked up this cute little bucket at walmart in the Halloween section to alter for $1.00. They have them plain (which is this one there is a strip that goes across the middle (under the ribbon) and they have ones that are decorated (hard to tell their decorated unless you look closely). I'm going to make another trip to Walmart this week to pick up a few more. I glued the ribbon around the center of thepail and where the ribbon meets I put a scallop circle there and the pumpkins are a rubon I had. 3. Sunday Scrappin Challenge this week was to create something that is mainly orange. I think this little pail is mainly orange. Does that count? LOL! I can not say this week went fast at all the work week dragged and of course the weekend flies by. If you haven't already checked out the Sunday Scrappin Meme, you must. It's a great way to take focus on your craft goals, you post your Ta Da's and your week's Ta Do's and if you don't stick to your goal for the week no pressure. Come on over and join us. First I want to thank everyone who gave my sister Kayla a big warm welcome to Sunday Scrappin last week. She's looking forward to participating more in Sunday Scrappin and crafting more. She won't be joining us this week being she was busy with school and family this past week she didn't get a moment to create anything but she will be back with us next Sunday. For those that did welcome her last week she has a special post on her blog for you. I really didn't have a crafty week neither. I have been battling a cold and just not up to much lately. This time of year really dampens my spirits due to the lost of our son. 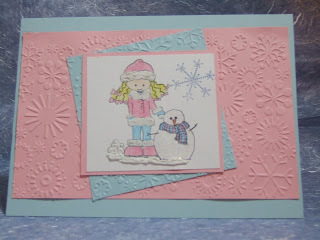 But last night I stayed up late making a card and doing the Sunday Scrappin Challenge. No way could I come here and not share anything. This card is okay. The sketch is from this weeks Taylored Expressions Cupcake Challenge. The stamp is of a Hershey kiss that I got when we went to the Big E Fair. The silver Hershey kiss is a brad. The letters are alphabet Christmas stickers. I bought a package of binder clips (they had about 10 different sizes in the package for $1 at Dollar Tree). I bought them awhile back to alter. I thought this would be perfect for this week's Sunday Scrappin Challenge. These would be great to put on your desk to hold a picture or an important reminder. This literally took me less then 5 minutes to make. I also decorated the back (it looks the same as the front). I may make some for Christmas gifts with a christmasy look or everyday style. (yes Kayla maybe you will get one for Christmas if your a good girl). This week's Sunday Scrappin Challenge is a color challenge. make the majority of your project the color orange. 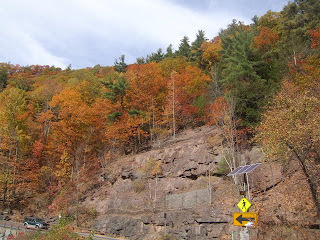 It's a great fall color, but one a lot of us don't use often. 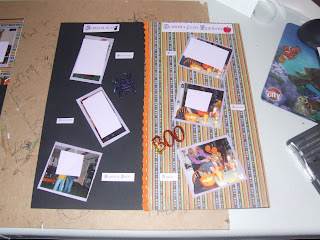 Do you have a fall scrapbook page to work on? 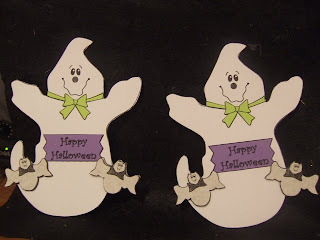 A Halloween card to make? A recipe to scrap? I think I can handle this. LOL! Can you believe I created absolutely nothing this week. I haven't been feeling well and work has been tiring me out. This time of year gets a little rough on me to, October 26 our son Dylan would have been 4 years old. I stop and think it feels like yesterday he was with us and is it possible he would have been 4 and then I do the math and yeah it's correct. So this time of year my mojo does tend to go south more often then usual. I didn't want to leave you with nothing so here are some things that I created before blogger. You can click on the pictures to make them bigger. All of these creations where made 1 - 2 years ago. 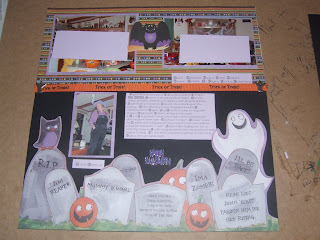 The Halloween layout is from my sister's 2006 Halloween Party. For the mummy card I used regular gauze wrapped it around the card then chalked it to give it the worn look. I saw this idea in a magazine. I made it out of an envelope. 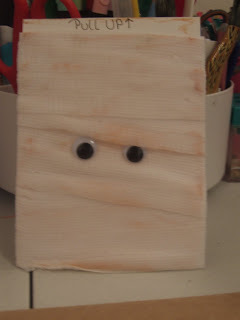 This was my sister's Halloween card the inside when you pulled it up said What type of music does a Mummy like. You flip it over and it says Wrap Music. The purple card was a simple card I made for Jeff. I used Jolee stickers and SU Spooky Skyline wheel. I hope to have a crafty day tomorrow. Hopefully I'll be back with newer creations.